How should we understand the God of the Bible? How do we make sense of God's apparently changing character in the Bible theologically? God is not obvious - unlike all the animate and inanimate objects which we can see around us. God does not appear to fulfill any useful purpose; what is God for or about? Is God just a mystery? Or a problem? Or both? In Who On Earth is God: Making Sense of God in the Bible Neil Richardson provides the answers to these fascinating questions. Richardson tackles the hard issues surrounding some of the more problematic passages head on, looking at divine anger, violence and jealousy, and suggesting how these can be interpreted. The book engages with the difficult questions posed by contemporary issues, and the 'new atheism' pioneered by popular writers such as Richard Dawkins. This takes discussion 'beyond the bible' into later developments in thought, and notions of God in a post-modern context. This is an indispensable guide for people with or without faith, wrestling with these difficult, and eternal, questions and themes. 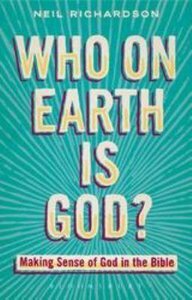 About "Who on Earth is God? : Making Sense of God in the Bible"
Neil Richardson was born in Turkey to tentmaker missionary parents. He wasraised in west London and came to repentance and faith at the age of thirteen. He read English at University College, London, (where he led theChristian Union) and took his Post Graduate Certificate of Education at Kings, London. After teaching for five years and then studying at CornhillTraining Course, he is now assistant pastor at Derby Road Baptist Church, Watford, England. His interests include open air evangelism, old people, kids, good books, music, clean comedy, games and running as far as he can.